Equipment: 11-inch Paella Pan – a double handled large sauting pan. You can purchase the paella pan in many department stores or Spanish importers. Saute onion, garlic and parsley in olive oil until the onion is softened. Add chicken bullion, peppers, saffron, chicken and saute until chicken is no longer pink. Add rice with water and bring to boil. Salt to taste. Boil for 5 minutes, stirring occasionally. Carefully rinse and clean mussels and shrimp. Add shrimp and mussels, boil an additional 5 minutes, stirring occasionally. Simmer 10 minutes covered, stirring occasionally. Adjust water during last 10 minutes, or evaporate any extra liquid by removing the cover for the last 10 minutes. Garnish with the parsley. 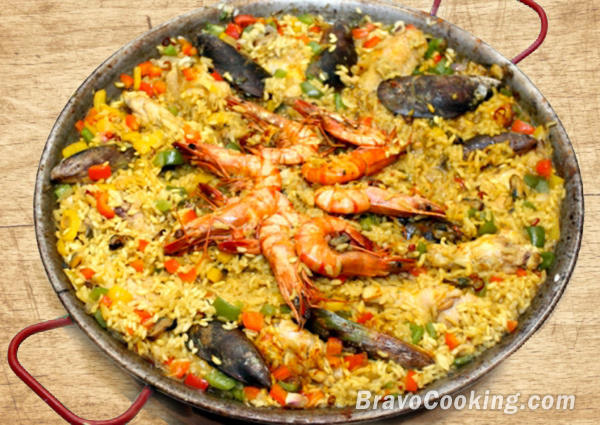 Paella is commonly served in the same pan it is cooked in. Otherwise, you can carefully use tongs to pick up the seafood and chicken and set aside. Transfer the rice and vegetables to a large decorative serving platter and then place the chicken, followed by the seafood on top of the rice. Great with gazpacho. You can change up the recipe by adding scallops, or eliminating the chicken, or some of your own ideas. Enjoy!